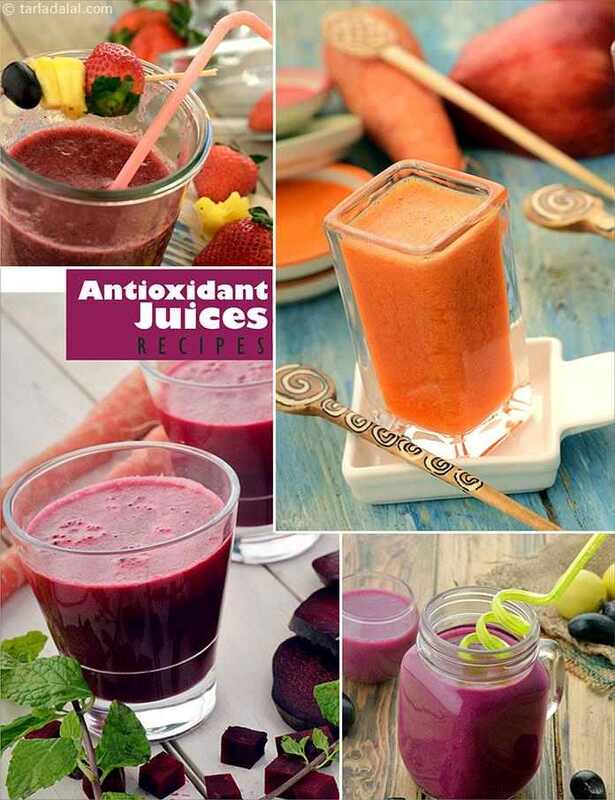 Here are some antioxidant rich juices, which you can include in your day-to-day diet. Try our only fruit juices which are naturally sweet like Black Jamun Apple Drink and Sweet Lime Pomegranate and Apple Juice. We have used also combinations of fruits and vegetables to make the juices healthy and tasty like Beet Treat Carrot Beet and Apple Juice and Flavonoids rich Red Capsicum Treat Red Capsicum Carrot and Apple Juice Try our only vegetable juice which is rich in Vitamin A, Carrot Spinach and Parsley Juice. All these juices are easy to make and are free from artificial colours and preservatives. And to add on to the nutritional quality, these juices are also free from added sugars. Having juices will also make up for the water loss that occurs due to sweating and will maintain water-electrolyte balance in your body. Juices also help to curb down your food cravings. Antioxidant boost, a potent antioxidant drink that fights all infections and enhances immune system. Eating so many fruits can be boring hence make it into a juice and gain their benefits. This low-calorie combination of easily available carrot, tomato and beetroot provides large doses of fibre and vitamin a, and is a perfect way to kick start the day! the lovely colour makes it especially appealing to kids. Apples with skin gives us fibre and vitamin c and carrots is a good source of vitamin a. . This drink is great to be had in the morning as it is very refreshing and healthy. . . Make this as close as possible to serving time. . .
Another unusual combination with fantastic results! offset the somewhat bland taste and colour of muskmelon in this juice by adding vibrantly hued oranges and carrots.